Feedback: 105 comments - leave yours! Let a few leaves of sage, parsley and thyme join the meat. 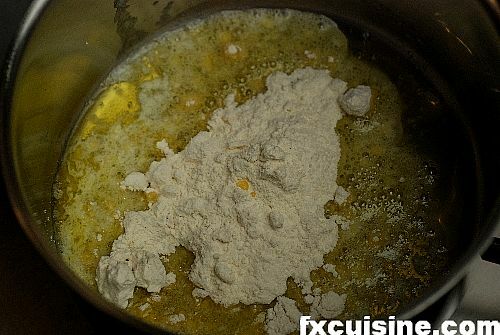 Prepare a roux by melting 4 tbsp butter with the same quantity of flour. This is a 16th century trick that will thicken the sauce. Add the roux to the pot, mix, cover and cook for a good 2 hours. Meanwhile, let's prepare the toppings. Start by cutting your dried bacon into julienne - small sticks. You can boil it for a minute before frying if you want. Then fry slowly in a saucepan until browned all over. Reserve. Peel your small onions. You can plunge them in a pot of boiling water for a few seconds to help. Then fry them for a few minutes in the remaining fat from the bacon. 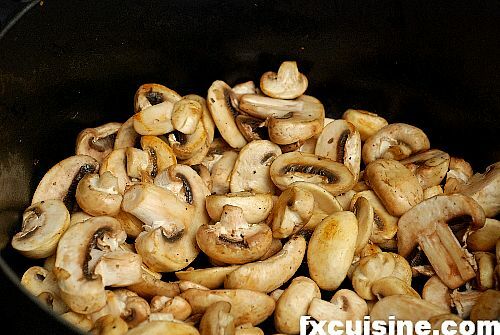 Finally, cut the champignons mushrooms into strips. Here is the completed garnishing or topping. Some people add croûtons, fried bread cubes. Add everything to the pot and cook for a further 30 minutes. Taste to see if you need more salt or pepper. ... with homemade potato purée. That looks absolutely delicious! 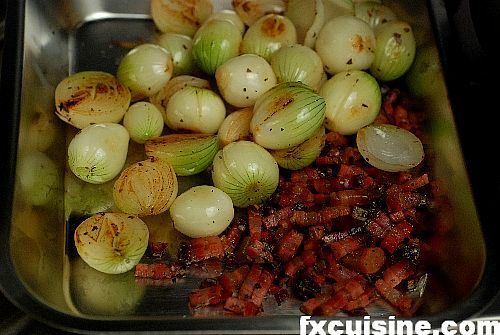 I love the picture with the grilled onions and browned bacon floating on top of that wonderful beefy liquidy goodness. This would be the perfect dish to make on one of these cold days. I like the way you served it with the potato puree, too. Very nice presentation. Anthony I hope you'll manage to cook this at home! 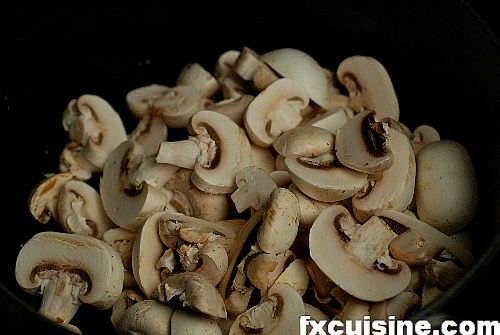 You can prepare a large quantity and reheat it several days in a row. You can even cook it for a party the next day. Thank you Tara, if you want to try one of them cult French stew I recommend you look at the Beef Carrot Daube which is even better! Like all stews, burgoos, and goulashes, this dish is better the second and third times you reheat it. They freeze really well; just let them thaw gently; the marbling in less expensive cuts keeps the meat moist. I tried this with home-grown Nubian kid meat - sounds strange, I know, but it was jolly good! Beatrice, you breed Nubian kids, this sounds very interesting! How many years do you keep them before you can eat them? I think it's a great idea to use some other meat to prepare this traditional French recipe, there is no reason why it couldn't work with other meats. Very nice bourguignon recipe, fx.Beatrice, are Nubian kids some species of goats? Yes, Djigen, they are a small sturdy African breed, very friendly and give rich milk that is good for making cheese. I'm going to prepare this dish tomorrow (Feb. 17), and I am looking forward with pleasure to the experience. One question: I did not see in the cooking directions at which point to add the tomato concentrate. Anyone? Wonderful pictures! Shows exactly how to do the recipe....Perfect! Jack, the tomato concentrate helps color the sauce, you can add it right before the long simmer. Let me know how this works for you! Thanks Phyllis for visiting. I hope you get to try this recipe! Bim thanks a lot for your comments! I like your ultralight pictures too! All I can say is "WOW!" I really cannot wait to try this recipe. Your photos are stunning! I don't think I have ever seen any quite like these. The directions are easy to follow and the presentation is incredible. Thank you for sharing this. I can tell you one thing. My family is going to love this one! Blessings to you and your family and thanks again! Rhonda thanks a lot for your comment! I recommend you try the Beef Carrot Daube as well, it is even better than Beef Bourguignon and kids love it and remember it for a lifetime. Thank you Tom, I hope you get to try the Beef Bourguignon some day in your kitchen! Francois, I made this with the Roasted Garlic Soup as an appetizer. Both recipes were fantastic! One of my guests commented that they had never eaten anything that delicious before, even in a restaurant. Thanks so much. Bill thanks for trying both recipes on the same day! I am so happy and yet not fully surprised by what your guests said. If you want to do the same some other day please do try the Beef Carrot Daube, it is even better! Greetings from Buffalo, New York.The recipe was excellent- a good stew for a day with 14" of snow! I prepared it in a pressure cooker, added the roux after the cooking was completed. Mac, I'm glad my recipe helped warm your winter day in Buffalo! Next time try the Beef Carrot Daube, it's even better. I just ate my leftovers from Sunday! Hello,First of all, I would like to congratulate you on your website. It makes everything look so easy and tasty!I have seen several different recipes for beef bourguignon and some feature bacon but some don't (all were French recipes). How common is the use of bacon in this recipe? Also the ingredients and way of cooking remind me a lot of coq au vin. Does this dish also come from Bourgone?Thanks! Jo, thanks for visiting from sunny Greece! Yes, bacon is present in all traditional beef bourguignon, although you can parboil it before using to get rid of the salt and excess fat. It is quite similar to Coq au vin but beef is definitely easier to get and easier to chew than rooster! Great recipe, especially the part about the Maillard reaction... :-D Now, as a gluten intolerant, I would not stand the roux, but maize flour can be used instead and requires shorter cooking time (wheat flour "eats" the flavour of a sauce until it is properly cooked; at least 10 minutes). Boeuf Bourguignon is what I serve for my "important birthdays" and such. A wholesome fare! Pastor, thanks for visiting! You absolutely do not need the roux and can thicken your sauce in a number of way, using butter, cornstarch (Maizena) and some of the many new products such as Caroube flour. The only goal of the roux is to thicken the sauce so that it wraps better around the ingredients. If you like this dish, you will love the Beef Carrot Daube also on my website. Happy cooking! Great recipe! Turned out VERY well for me. I especially like your large photos and direction. Peter, thanks for trying this and congratulations for your success! Try the Beef Carrot Daube next time, you'll love it. So, thanks again FX. I am cooking this now, for the second time, it is almost done and I feel it will be very good. As luck would have it, this overcast and muggy Dutch day has resolved into a rainy and almost-chilly Dutch night, which makes the Boeuf really appropriate. On another note, I noticed that your blog platform mangles HTML markup. Perhaps you might want to put a remark about it in the comment form. Walter, good luck with the Beef Bourguignon and if you keep any overnight remember to keep the meat submerged in sauce. Sorry about the HTML markup, the blog feeds on it! I make this often but i just found your recipe- it differs a bit from the one I usually use- my question is regarding the Grappa, i use cognac or brandy because that is what the first recipe i ever read used, what exactly is Grappa? Based on what i read it is a pomace made Brandy- so I assume using Brandy or Cognac is just as good? Also tomato concentrate is tomato paste ? Do you think someone that LOVES this recipe but hates carrots - such as my husband who picks out the carrots- would enjoy the Daube? Anna, grappa is distilled fermented grape skins. After you have pressed grapes to make wine, you take the skins, add water, ferment them and distill it. Doesn't smell very nice until it's bottled I must say! Absolutely incredible recipe! Goes great with mashed yukon golds with white truffle oil and black sliced truffles. Taylor, thanks for visiting. I'd say that for me all that is needed with the truffle is the Yukon potato, the bourguignon is a bit potent for the delicate undeground flavor of the truffle. What a beautiful recipe. The pictures are just gorgeous - you are very talented indeed! I am cooking a dinner party for 14, how many does this recipe feed? How many kilos of meat would I need for 14? I am planning on serving it with pureed potatoes - I can't wait! Natasha, in a three-course meal I normally use 200gr / 3oz of meat per person. So my recipe being for one kilogram of meat, you need to triple the proportions and you'll feed all 14 guests. Have fun and let me know how it went! This recipe is amazing, it tastes great and the smell in intoxicating! 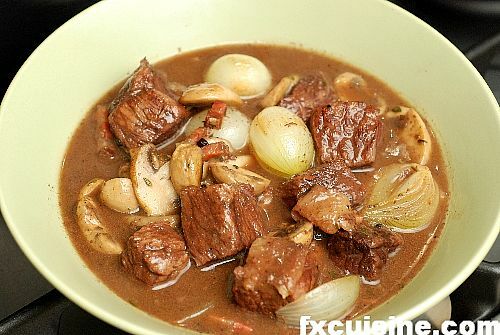 Chef Wannabe, I recommend you try this beef bourguignon, very popular in this season! This looks amazing! I usually dont use a recipe for it, but I was looking and found this. Perfect October dinner. FX's answer→ Taratootie give my recipe a try and let me know! I must say you have great recipes.. I love food, especially Thai, Italian, Indian, Middle eastern and French. As a food connoisseur.. I would appreciate it if you could review some of my recipes and suggest any alterations, if needed. 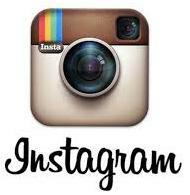 Grouprecipes.com, user name- UK2NYC.. I am making your fabulous Beef Bourguignon tomorrow.. its marinating right now.. since i couldnt find any burgundy in my local supermarket.. i used a Valpolicella.. do you think that would work? I guess a Pinot Noir would be closer to a burgundy? Any suggestions.. Thanks again for the wonderful recipes. FX's answer→ Enjoy your meal Richard! I just had some at a wonderful restaurant in Vancouver, and it was heavily peppered. They must have added cracked pepper quite early in the process, because it was very spicy from the pepper. Of course it's up to the individual chef, but is it common for this dish to be spicy? FX's answer→ Brenton, it all depends on the chef. In Italy they say that for salt we need a wise man, but for pepper a madman. This is a great and very tasty recipe. (Better, I thought, than the Cafe Rouge version that gave me the idea to try it). I added the roux just before the long simmer as I was worried about it sticking to the pan. Glad I did because it did tend to stick and needed very frequent stirring. FX's answer→ Kevin, great to hear this worked for you! FX's answer→ Thank you Josette, hope you get to try it! THIS IS A WONDERFUL RECIPE. NOT ONLY TO I REALLY like IT, BUT ALSO I HAVE PREPARED IT FOR TWO FRIENDS WHO RAVED ABOUT IT. THANK YOU FOR SHARING THIS WITH ME. FX's answer→ Thank you Frank, glad you liked it! Hi, thank you for this wonderful recipe, I have made my own version of this recipe, very closely actually. I love the close-up pics you use. My question is, where would I find dried bacon? In the recipe, is it peppered bacon, it looks that way in the picture? Does is matter if I use regular bacon? Thanks! 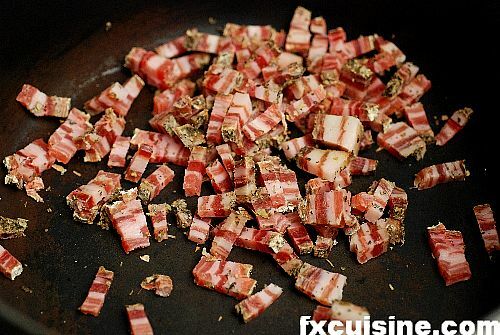 FX's answer→ Abbey, I use dried Valaisian bacon, you are unlikely to find the same in the US but you could use an Italian dried bacon or just go for regular bacon, which should work equally fine! I wonder though, do you cook Vietnamese food? I am struggeling with Phở. Trying (and succeding to a degree) with beefbroth mixed with some chicken broth (all made from scratch) and oxtail and the usual spices, Cloves, cardamom (only slight) star anise, cinnamon and some others I cant recall now. Scorched ginger and onions, garlic in heaps. Any hints or tips ? FX's answer→ Well thanks for the positive ridicule! I am not really all that conversant about Vietnamese foods although I have fond memories of some of my Mom's students making us spring rolls. Don't know about Pho though. And I am Swiss, not French. Tried it out on my extended family last night and it received a heroic reception. Kudos for making me look good! (what else matters?) . BTW, your photographs are magnificent. I love to complement exceptionally good work and here goes: WELL DONE! FX's answer→ Thanks Oliver for checking back and I am most happy to learn that you were the soul of the party yesterday thanks to this little recipe and your brave efforts no doubt! Hi there Francois, since finding your website (while searching for a beef bourguignon recipe actually!) a few weeks ago I have devoured it with great enjoyment. The photos are fantastic, and the recipes inspirational - and you are just very witty and funny. And since I am originally from Germany and grew up in the Dreilaendereck, near Basel, I love to read about all the Swiss food and the cheeses. I miss the swiss cheese a lot - I live in New Zealand now. Anyway tonight I finally got a chance to try this recipe, and it was just delicious. A real winner. I look forward to trying more recipes from your blog in due course. Yum Yum! FX's answer→ Thanks for trying this Angenita! I am told New Zealand's landscapes look very much like Switzerland, plus the terrific tropical climate in other areas of the country. You miss the cheese but you must get terrific seafood and fruits! With all respect, I don’t agree that it gets better then reheated. Maybe I do something wrong but both then I made Beef Bourguignon and coq an vin the same thing happened, first it tasted good, but then I reheated the leftovers the next day it had lost a lot of taste and was quite plain. Anyway your blogg is one reason that I lately have rediscovered how fun, fine tasting and addictive good home cooking is. Thank you for that. FX's answer→ Thanks and if you make it right you won't have any leftovers to worry about anyway! 1) How much do you need of each herb? I heard sage, thyme and the cloves in particular are very potent and will overpower everything if you put too much. 2) Can I get by with just using half a glass of grappa? 3) Will any other kind of brandies do just as well? 4) The contents of the marinade - do you cook it with the meat/sauce or do you discard it? 5) Oven or stove for when you're cooking everything in the pot? 6) With the small onions/bacon/mushroom, do you actually mix it with the contents of the dish or just place it on top for that 30 min duration? Your recipe has everything: knowledge, tradition. At the same time, an excellent update without loosing essence and originality,and the most important simplicity and an useful step by step guidance. I´ll tried this week for some friends. I have my own recipe, but yours is much better. 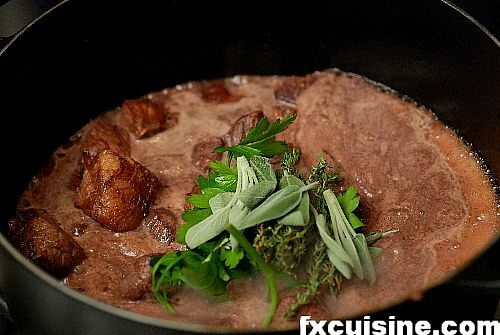 FX's answer→ Thanks Coco, make sure you also try the Beef Carrot Daube, it is even better! Friends and I went to see the movie "Julie and Julia" and we loved it. We came home with our mouths watering after all the delicious meals were fixed. We particularly liked the beef Bourguignon. FX's answer→ I hope you get to try this at home Martha! I am very happy to see detailed pictures, and the very easy to read directions. I'm actually going to make this for Christmas Day this year! My mother (who is French)used to make the most wonderful bourguinon when I was a child and I have very very fond memories of the dish. Sadly she now has Alzheimers and is unable to cook anything but I will liquidize it for her and see what she thinks! Thanks for the wonderful photos. FX's answer→ Well good luck! And liquid Boeuf Bourguignon is a think you might submit to Heston Blumenthal. WOW, this is a super recipe, the only problem was the Grappa was not obtainable, so I put Brandy (Remy Martin) well a good wine deserves it, I have done this recipe over 2 days and now, the house has a wonderful fragrance. FX's answer→ Fantastic, a good brandy will definitely do equally well. Glad it worked for you! 1. Can I have it ready sunday evening and serve it monday evening? 2. Is there a specific type of red wine I should use, or using a red Shiraz wine is fine? FX's answer→ Thanks Alexis, yes you can cook it one day before but make sure not to overcook it. Shiraz sounds like a good wine but of course if you can get a wine from Burgundy, France, that would be more in character. Happy Christmas! I was lookig for a recipe and i found yours!Its amazing, and it sounds delicious!I'm goin to to make it this sunday! I just had a doubt! Here in Brazil, i could not foun the Grappa, do you think that if i not used it, it will be too much different? I would be glad if you answer me! FX's answer→ Ana, you can use a different dry eau-de-vie or cognac or even whiskey instead. All will impart a different taste, but all should be good. Don't use any of these industrial drinks or sweet liqueurs. "The browning reactions which occur when meat is roasted or seared have often been referred to as Maillard reaction browning. However, lean meat contains very few, if any, reducing sugars. Furthermore, red meat undergoes more extensive browning than does white meat. The browning reactions in lean meat are most likely due to the breakdown of the tetrapyrrole rings of the muscle protein, myoglobin. Thus, the browning of meat is technically not a Maillard browning since it does not involve the reaction with a reducing sugar"
Also, I am trying this recipe using a bottle of corked Taurasi . . . hoping the TCA evaporates along the way. Will let you know the result. Fingers crossed. FX's answer→ Yes, that's Maillard for you. You can read more in Hervé This or Harold McGee. I made this with small, whole cippolini onions and the results were excellent. Thanks for the great site. FX's answer→ Thanks and glad to hear this worked for you! Hello and thanks for this spectacular recipe. I did it! I posted it on my blog, so you can see the dish. Of course it doesn't look as nice as yours, but it tasted heavenly. My kids and I are snowbound in Pannsylvania this weekend so we decided to cook BB. We added a whole orange to the simmer phase, and tarragon and chervil in the Bouquet garni, replacing sage with Bay. We added all the liquid + contents to the simmer, and used the bacon fat for the roux - formed in situ round the beef after browning - rather than extra butter. Our onions were shallots and the wine was Spanish - Couldn't help it - apologies; but it turned out beautifully all the same. I'd never made BB using any eau-de-vie before and it definitely livens it up. Great tip! Your pictures are an inspiration. what a mouth watering display of photos. i've made this a million times and it is my firm absolute favourite for red meat, yet i've found more flavour following your instructions. A truly excellent site, merci beaucoup. FX's answer→ Thank you Benjamin! I tried this with venison and oh my oh my! I used a little added beef fat to help with the sauce, yum, and the potato puree was wonderful instead of boiled potatoes. Loved it, thank you for the recipe and help. 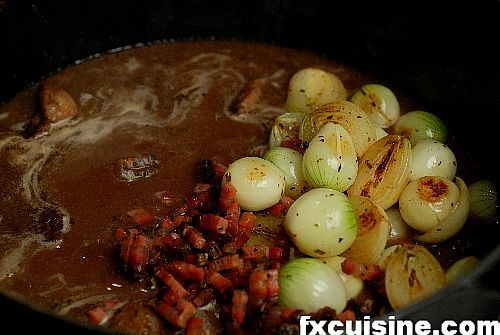 I noticed in most recipes, Bouef Bourguignon is braised in oven instead of on top of the kitchen stove. Do you think by doing properly, the two ways would give equivalent outcomes? I personally always prefer using stove since it's easier to handle (I always burn myself while using oven), but I'm imagining the oven might produce some sort of caramelizing effect and not so easy to burn at the bottom.... Actually, I'm quite amazed that you didn't have this problem, and you even added roux! Do you have to stir it once in a while? BTW: in switzerland, which type of cuts do u think is best for this dish? thanks again. FX's answer→ For cooking braised dishes you can very well put the pot in the oven for an nice, wrap-around constant heat. If you use a stove instead just make sure there is enough liquid and the pan can absorb and spread the heat. It's not really necessary to stir although I find hard not to peek and usually give it a stir as self-justification for having opened the pot! FX's answer→ Tanya, you need to let your beef cook longer and stop the cooking when it is soft. Glad it worked for you though! I'm cooking this recipe with a minor variant: separate the vegetables and braise them in the oven. I will cook the meat for 3-4 hours at least until it really gets tender, cause i'm using the same meat as ossobucco. I will use the medula to end the sauce. FX's answer→ Ordo, beware of overcooking the meat, tender is nice, but after 2 hours' cooking it starts to turn mushy, if you still have a couple teeth left it's not really a plus! You were so right. The meat came hard to eat. So much to learn. 1. Your Spanish translator is amazing. Please tell her. 2. You're a great product photographer. FX's answer→ Thanks Ordo, and next time try the Beef Carrot Daube, also on my website, I actually like it even better than Boeuf Bourguignon. 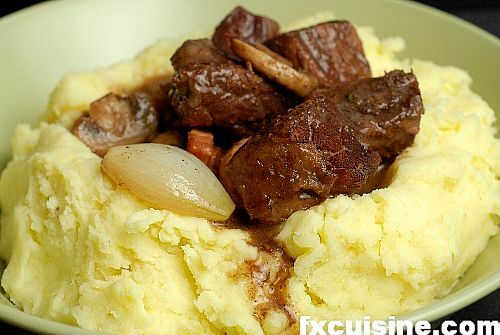 I am French, living in France and was looking for a good boeuf bourguignon recipe. I followed the recipe almost exactly, not filtering the stock. It was really delicious. Thank you! Hi FX! Not being original here, I wanted to say that this is an amazing recipe, I found it very inspiring. Have you ever tried its Flemish equivalent, hachee? For those who never heard of it, it's a fairly similar dish, but stewed in Belgian brown ale instead of wine. It's amazing, especially in the the wet autumn climate in the lowlands (Belgium, and my home country, Holland). Hi FX! I love your recipe pictures and am planning on making this in the next couple of days.I have a family of 5 and like to have left overs to freeze so i will be doubling the recipe. Should I make any modifications other than just double all the measurements? How about the cooking time? FX's answer→ Corbin, sorry for my late reply, yes you can just double the recipe, but certainly not the cooking time. This dish can get overcooked. Hi, thanks for the fantastic recipe! Well, I haven't actually tasted it yet, but it's marinating right now and I can tell it's going to be great. Also, american-style bacon didn't seem quite right, but at the market I found some "pork side-meat" which looks just like thick, fatty blocks of bacon. I guess any similar pork fat will add plenty of good flavor. Thanks again, I really enjoyed following this recipe, and I'm going now to look at others, specifically the beef carrot daube. FX's answer→ Very good, I'm glad you decided to try it and hope it will be a resounding success! 800 gms of small onions is a hell of a lot. Are you sure this is correct? 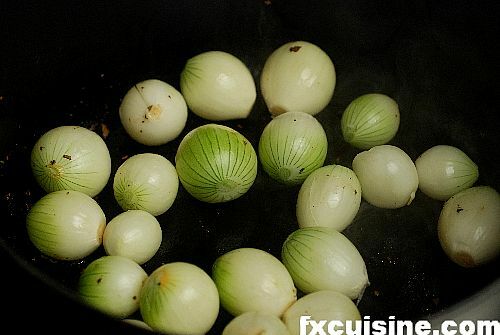 I don't see any photos here that show 800 gms - the shot of the small onions in the pan looks to me to be no more than about 400 gms. ??? Beef Bourguignon can be cooked several ways, and i tried it all including Julia Childs with the carrots etctc...but yours came out the BEST!!!! Followed your recipe and now all my family want more. Thank you for sharing! FX's answer→ Glad it worked for you!